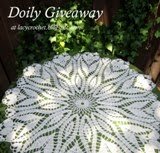 I wanted to have a doily giveaway for quite a while, but I contemplated for a little whether I should give this particular doily away. 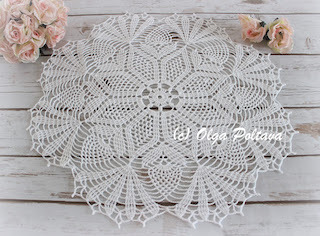 After all, it’s one of the biggest and most gorgeous doilies I’ve ever made! But the truth is I am accumulating a lot of them! Sharing my work with others will be a better use than just keeping it my drawers. 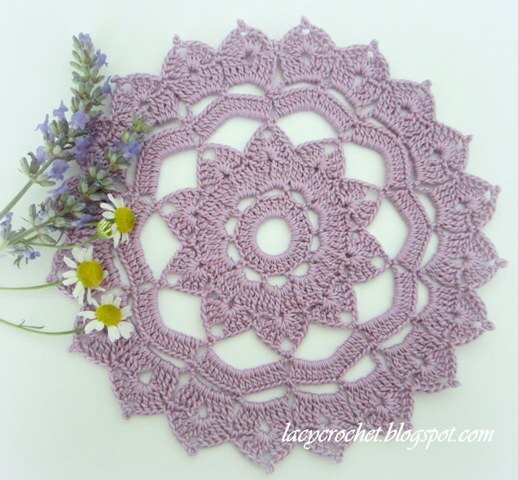 Besides, I still have the pattern and can make another crocus doily anytime I want! 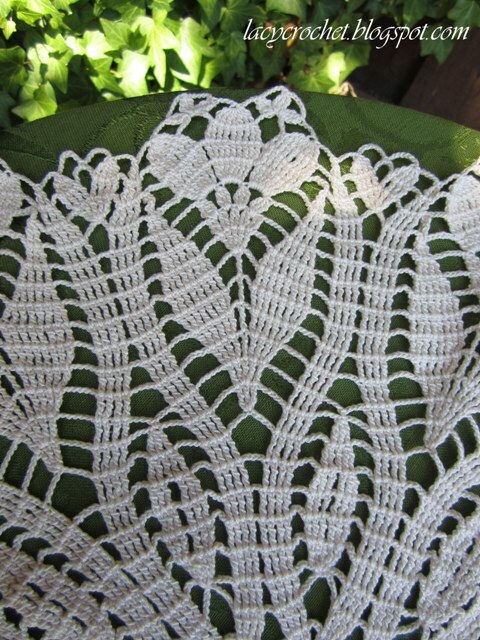 Here are some details about this doily: It’s made of crochet thread size ten in ecru color and measures almost twenty inches across. • Just leave me a comment below letting me know you would like to participate. 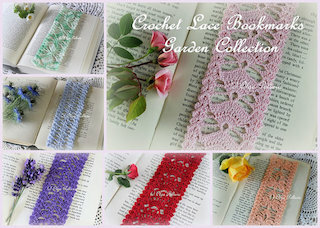 • You can have an additional entry if you follow Lacy Crochet either via Google Connect or Facebook. Please, leave me additional comment letting me know that you are a follower. • You can have yet one more entry if you post about this giveaway on your blog or have a button for this giveaway on your blog’s sidebar! Again, please leave me an additional comment. That’s all there is to it. Anyone around the world is welcome to participate. The winner will be chosen randomly and announced on Sunday, July 15, 2012. The last day to enter the giveaway is July 14. 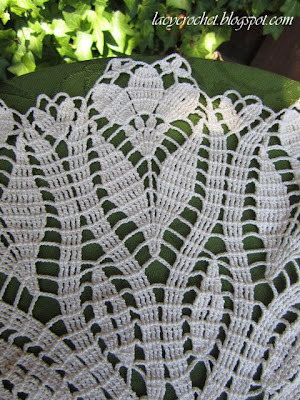 A few days ago one Lacy Crochet reader asked me for help with an Irish crochet leaf and sent me a picture. 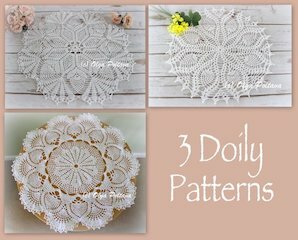 I had never tried my hand at Irish crochet before, but I’ve seen some gorgeous doilies, tablecloths, and even tops and dresses made in this crochet technique. I always admired them but was too intimidated to try something that complicated myself! But now, thanks to my reader, I made my first step into the direction of conquering Irish crochet technique. 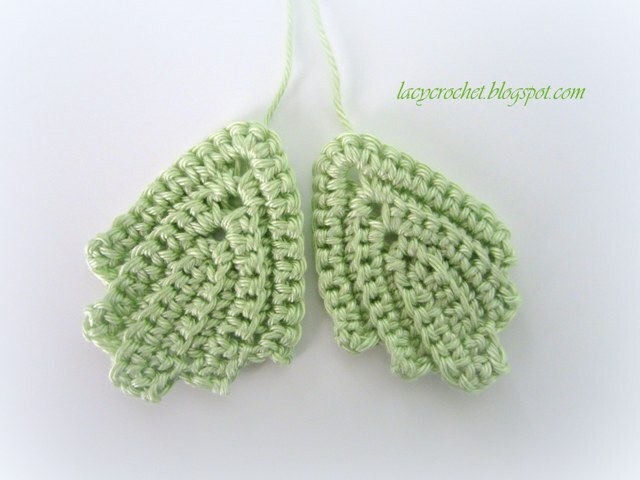 I looked at some leaves online to get the idea how they are crocheted. Then after some experimenting, I was able to come up with my own leaf similar to the one in the picture that my reader sent me. At first, I was going to sketch a symbol chart for it, but it proved to be a difficult task. Somehow I just couldn’t get the spacing right (I’m not an artist and I don’t have a symbol chart making software). So I thought it would be easier to write a pattern. After all, there are only five rows in my leaf. I am posting the pattern below. Please note that I didn’t have anyone to test this pattern. If you find any mistakes or have questions about it, just write them in the comments, and I will try to address them as soon as possible. 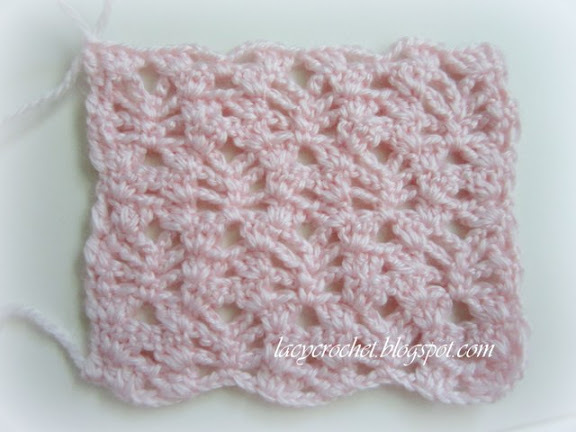 It might be confusing if you start this pattern with crochet thread, so I suggest you practice with yarn first. 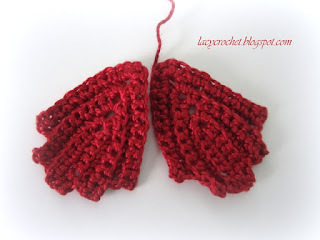 Once you get the grip of the pattern, it will be easy to make this Irish leaf with thread. The green leaves in the picture were made with cotton yarn, and the red ones with pearl cotton thread. Work all stitches in standard location unless specified otherwise. Row 1: Sc in 3rd ch from hook and in each chain across (6 sc in total), ch 3 , sc in the same ch. Continuing along the other side of the starting chain, sc to end of chain. Turn. Row 2: Sl st to 2nd sc, ch 2. Working in the back loop 5 sc. [Sc, ch 3, sc] all in ch-3 space. Working in the back loop 6 sc. Ch 2, turn. Row 3: 6 sc, [2 sc, ch 3, 2 sc] all in ch-3 space, 7 sc. Turn. Row 4: Sl st to 2nd sc, ch 2. Working in the back loop 6 sc. [2 sc, ch 3, 2 sc] all in ch-3 space. Working in the back loop 7 sc. Ch 2, turn. Row 5: 8 sc, 4 sc in ch-3 space, 9 sc. Fasten off. Wave in ends. 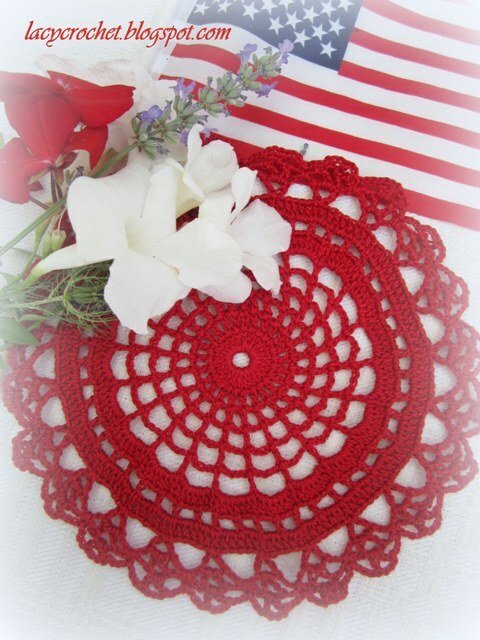 I’ve seen so many beautiful patriotic doilies around the blogland. And with the Independence Day approaching, I wanted to make one for our celebration table. 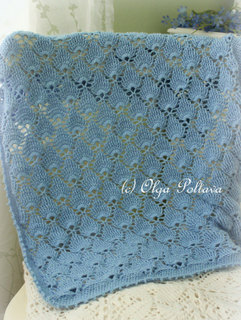 Unfortunately, I was not able to find cotton crochet thread in dark blue. So I had an idea of decorating our table with small red and white doilies and adding some other accents in dark blue. I already have a few small doilies in white, but I had to make one in red. 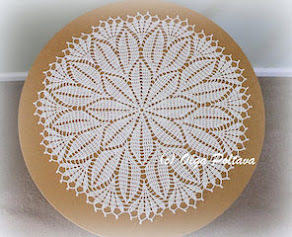 I used pearl cotton for this doily, and it came out a bit bigger than ten inches in diameter. 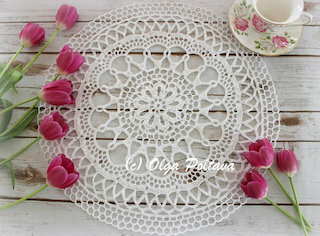 This doily had only 12 rounds and was very easy to make. 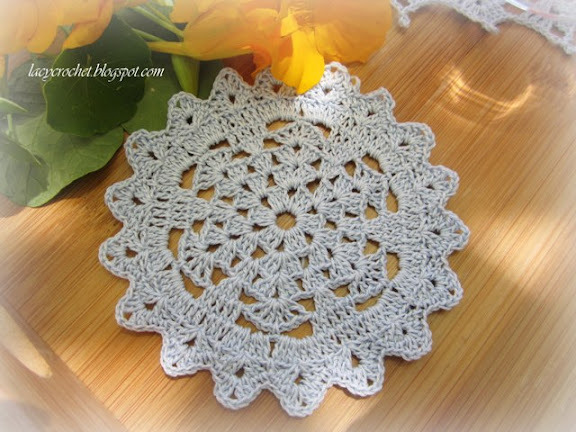 This would be a perfect doily project for beginner crocheters. Ch 10, join with sl st. 1st rnd: Ch 3, 21 d c in ring. Join with sl st in 3rd ch of ch-3. 2nd rnd: Ch 4, 1 d c in each d c of previous rnd with ch-1 between. Join with sl st in 3rd ch of ch-4. 3rd rnd: Ch 5, 1 d c in each d c of previous rnd with ch-2 between. Join with sl st in 3rd ch of ch-5. 4th rnd: Ch 6, 1 d c in each d c of previous rnd with ch-3 between. Join with sl st in 3rd ch of ch-6. 5th rnd: Ch 7, 1 d c in each d c of previous rnd with ch 4 between. Join with sl st in 3rd ch of ch-7. 6th rnd: Ch 8, 1 d c in each d c of previous rnd with ch-5 between. Join with sl st in 3rd ch of ch-8. 7th rnd: Ch 3, 6 d c in each sp and 1 d c in each d c of previous rnd. Join with sl st in 3rd st of ch-3 first made. 8th rnd: Ch 5 * skip 2 d c, 1 d c in 3rd d c, ch 2, repeat from * for entire rnd. Join with sl st in 3rd ch of ch-3. 9th rnd: Ch 3 * 2 d c in ch-2, 1 d c in d c of previous rnd, repeat from *. Join with sl st. 10th rnd: Ch 6, 1 d c in same st from which ch-6 started * ch 5, skip 5 d c, 1 d c in 6th d c, ch 3, 1 d c in same st, repeat from * to end of rnd. Join in 3rd st of ch-6. 11th rnd: Ch 6, 1 d c in 1st ch-3 loop, * ch 6, skip ch-5 loop and make 1 d c in next ch-3 loop. Ch 3, 1 d c in same loop. Repeat from * to end of rnd. Join with sl st in 3rd st of ch-6 made. 12th rnd: Ch 6, * 1 d c in same loop, ch 3, 1 s c in center ch of ch-5 of 10th rnd having the ch-6 of 11th rnd caught by this s c, ch 3, 1 d c in next ch-3 loop ch 3. Repeat from * to end of rnd. Join with sl st in 3rd ch of ch-6 made. 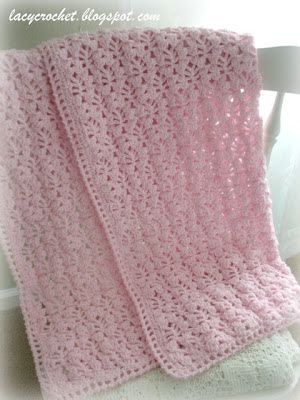 Since back in February I shared a picture of the baby blanket that my mom made, many people asked me about the beautiful lacy stitch that she used. And no wonder because such baby blanket would make a perfect gift. My mom has made several of such blankets so far, and they were very appreciated. I even sold one in my community. 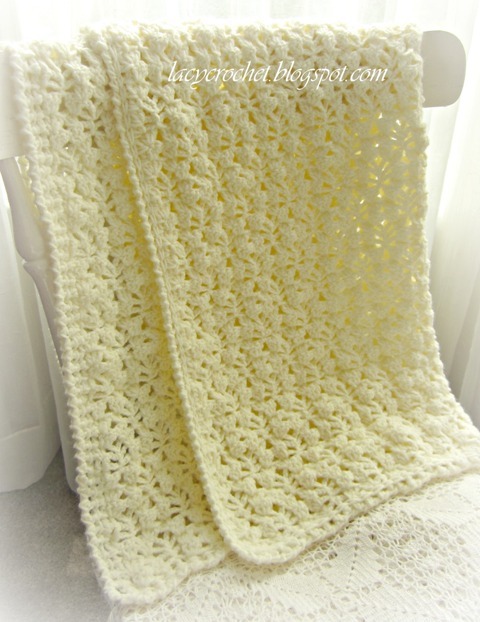 In addition to pink, she made them in pale yellow (shown below), light green (unfortunately, I didn’t have a chance to take a picture), and white (I still have this blanket, might share a picture later). 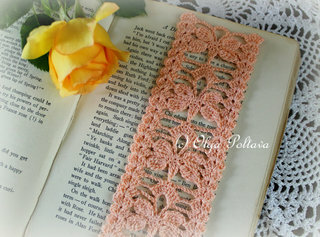 And I must say this lacy pattern looks fabulous in all colors. 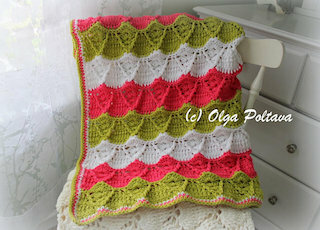 By the way, if anyone would like to commission such blanket to my mom or me to make, please e-mail me privately. I am happy to share this lacy stitch with everyone. 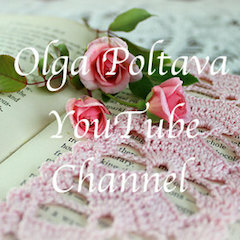 Special thanks to the ladies from Crochet Partners Yahoo group who tested it for me. 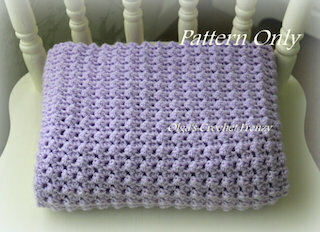 Please note, this is not the pattern for the blanket but just the main stitch. Once you are comfortable with the stitch, it won’t be difficult to make a blanket. Just measure your swatch and figure out the measurements for your blanket. In the swatch shown above, I started with chain 36. 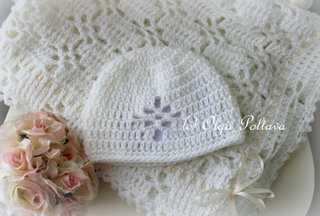 If you would like to share this pattern with others, please refer them to my blog. It took me a lot of work to write the pattern, so please do not redistribute it. Thank you. Row 1: 3 dc in sixth ch from the hook, skip 4 ch, 3 dc in next ch, *ch 3, skip 2 ch, sc in next ch, ch 3, skip 2 ch, 3 dc in next ch, skip 4 ch, 3 dc in next ch*, skip 2 ch, dc in next ch. Chain 2, turn. Row 2: 3 dc in next dc, skip 4 dc, 3 dc in next dc, *ch 3, sc in next sc, ch 3, 3 dc in next dc, skip 4 dc, 3 dc in next dc*, dc in next dc. Ch 2, turn. Row 3: 3 dc in next dc, skip 4 dc, 3 dc in next dc, *ch 3, sc in next sc, ch 3, 3 dc in next dc, skip 4 dc, 3 dc in next dc*, dc in next dc. Ch 2, turn. Row 4: dc in next dc, *ch 3, sc in space between next 2nd and 3rd dc (it’s the space between two shells), ch 3, skip next 2 dc, 3 dc in next dc, 3 dc in next dc*, ch 3, sc in space between next 2nd and 3rd dc, ch 3, skip next 2 dc, dc in next 2 dc. Ch 2, turn. Row 5: dc in next dc, *ch 3, sc in next sc, ch 3, 3 dc in next dc, skip next 4 dc, 3 dc in next dc*, ch 3, sc in next sc, ch 3, dc in next 2 dc. Ch 2, turn. Row 6: dc in next dc, *ch 3, sc in next sc, ch 3, 3 dc in next dc, skip next 4 dc, 3 dc in next dc*, ch 3, sc in next sc, ch 3, dc in next 2 dc. Ch 2, turn. Row 7: 3 dc in next dc, *3 dc in next dc, ch 3, sc in space between next 2nd and 3rd dc, ch 3, skip next 2 dc, 3 dc in next dc*, 3 dc in next dc, dc in next dc. Ch 2, turn. 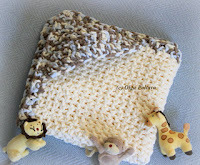 The yarn used for these blankets was Pound of Love by Lion Brand. 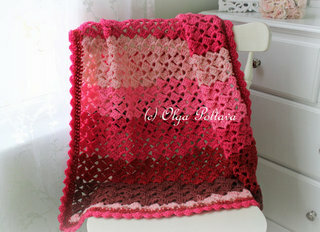 Update: My free pattern for this entire blanket is now available as well. 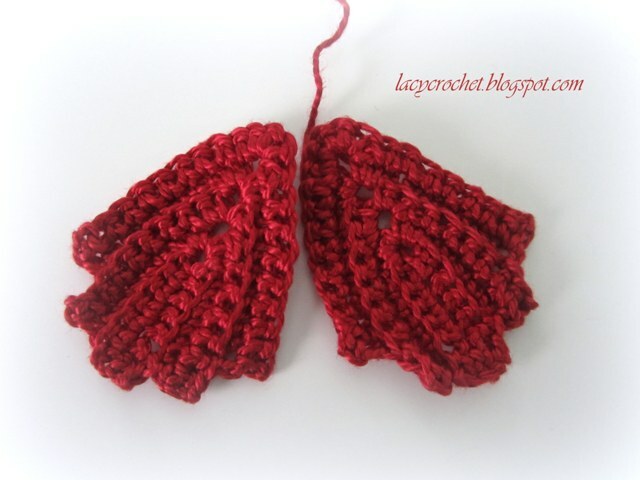 Click here for the pattern. I think this is one of the most gorgeous doilies I’ve ever made! 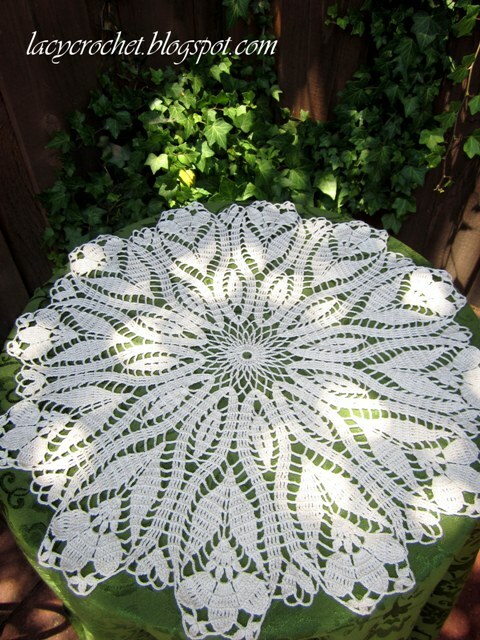 Measuring almost twenty inches in diameter, this big doily will make a perfect centerpiece on a large dining table. It will also look charming on a small side table. I used size ten cotton thread in ecru color. The pattern, which has 25 rounds, is not an easy one; yet it is not extremely difficult. I enjoyed making this doily especially once the crocuses began to appear. 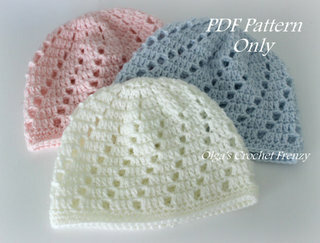 I found the free pattern at Coats & Clark website (see the link below). If you really love this crocus doily, make sure to come back to Lacy Crochet blog later this month as I am going to announce a giveaway for it. I am really enjoying the first days of June. 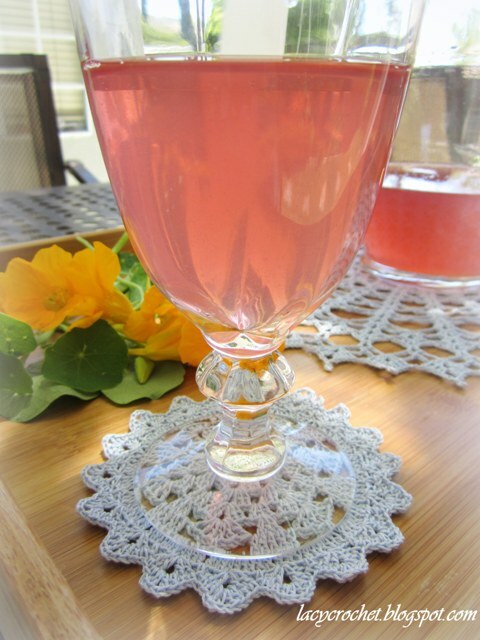 The weather is perfect, and it’s so nice and relaxing to sit outside in the yard with a glass of lemonade or fruit punch in a pretty goblet. 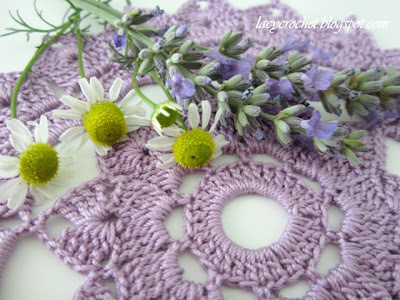 Crocheted doily coasters can add an extra delight to this lazy time passing. The original pattern for this small doily has nine rounds. However, I only made eight for mine. I liked it the way it looked with only eight rounds. 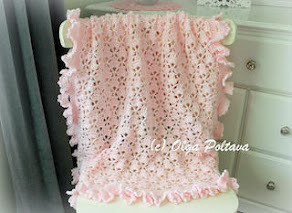 Also the seventh round was somewhat confusing to me, so I am not sure I crocheted mine as in the pattern (I mostly relied on the photograph for that round). 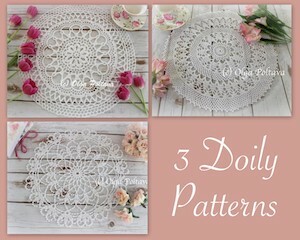 But otherwise the pattern was easy to follow and the doily was quick to make. 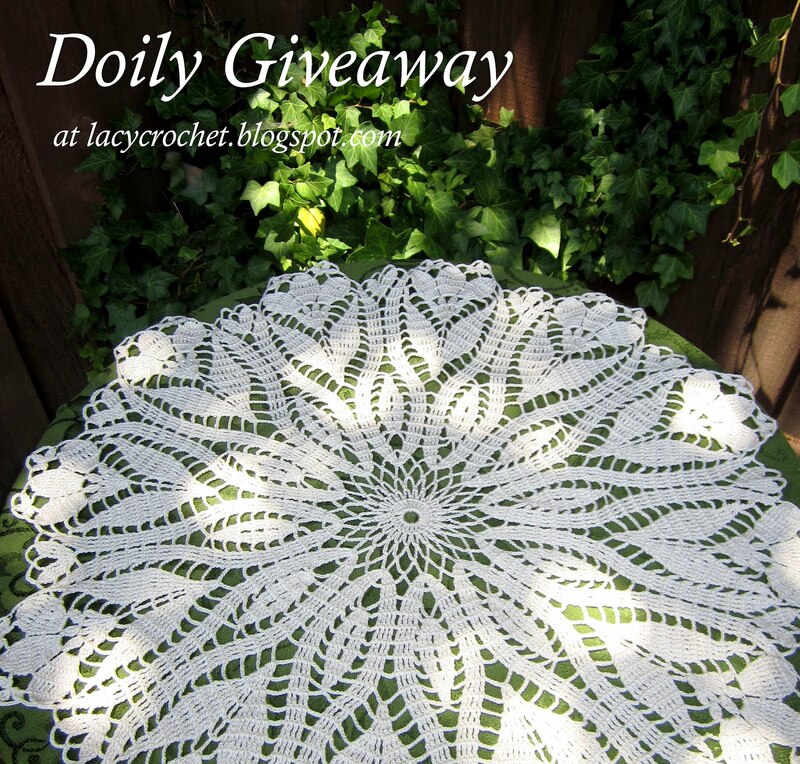 Doily of the Week is back! I finished crocheting this small doily a couple days ago. The pattern is quite easy and has only nine rounds. I used crochet thread number ten and steel hook size ten. My doily came out six and a half inches in diameter.